Basket Weave : Variation on a plain weave; two over, two under. Broadcloth : A tightly woven lustrous cotton cloth with fine embedded cross wide ribs. It resembles poplin and is used extensively in shirts and blouses, as well as home decorating. Butcher’s Linen : It was originally a heavy, sturdy linen fabric used for French butchers’ aprons. This type of heavy fabric was also used for interfacing. Corduroy : A ribbed, pile fabric. Comes in various weights and weaves. Used widely for both apparel and home furnishings. It may be coming back, so I am ready to break into my 60 & 70’s stash. Chambray : A plain-weave fabric made of color warp yarn and white fill yarn. Chenille : A fuzzy cotton yarn or fabric that has pile protruding around it. Chenille is the French word for “caterpillar.” Now you see why they had to give it a name like Chenille. Who’d want to wear caterpillar? Chintz : Glazed cotton fabric, often printed. Used widely in upholstery fabric. Cotton Sheers : Batiste, lawn, organdy, and voile are all cotton sheers. Used for both home and apparel products. Damask : Sometimes mistakenly called Jacquard because it is produced on Jacquard looms, is a patterned cotton fabric. It is used for decorative fabrics and fine apparel. Jacquard : The Jacquard loom produces elaborate cloth weaves that are very important for decorative fabrics, such as tapestries, brocade, and damask. A Jacquard Design includes very detailed, intricate motifs. Venise : It is a very fine damask table linen consisting of large floral patterns. Duck : Also known as canvas. A rugged plain-weave cloth. Dotted Swiss : Lightweight, sheer, fine-yarn fabric with small dotted areas that have been either woven or flocked to achieve the dot effect. Double Knit : A circular, knit fabric of double thickness. Dye Lot : Variations in the chemical concentrations from one batch to the next Reversible fabrics. Denim : A rugged, durable twill fabric that is most popular in indigo blue. Denim rules the casual apparel world, but it has also become popular in decorative fabrics for the home. Embroidered : Art of creating and producing raised designs or motifs on woven fabrics. Flannel : A plain-weave cloth heavily brushed for softness. Often used in apparel and sheets. Herringbone : Considered a broken twill because both right and left-hand twill resemble the backbone of a herring fish. Interlock : A double-knit, plain-stitched fabric that looks the same on both sides. Used for home and apparel. Jersey : A single-knit, plain-stitched fabric with a face side that is distinctly different from the back side. Used for both home and apparel consumer products. Recently, American manufacturers have introduced cotton jersey for bed linens. Matelassé : A dobby or jacquard cotton fabric. The pattern stands out to give a quilted look for bedspreads and other home fabrics, or fine apparel fabrics. Oxford : A group of cotton fabrics, including pinpoint, made with a modified plain or basket weave. Used primarily for shirting. Poplin : A fabric with a fine horizontal rib effect on the surface because of a warp yarn finer than the filling yarn; usually a high-thread-count cloth. Poplin is used for high-quality shirting. Pique : Medium-weight, crisp, cotton-type fabric with raised dobby designs. Plain Weave : Yarn passes alternately one over, one under until the yarn is full. Polyester : Manufactured fiber in which the fiber-forming substance is any long-chain synthetic polymer composed of at least 85% by weight of an ester of a substituted aromatic carboxylic. Pima Cotton : It is from Egyptian cotton, is an excellent quality cotton fabric. Plissé : Fabric treated with a solution that shrinks parts of the goods to create a crinkle or pleated effect. Used for both home and apparel. Polished Cotton : It is either a satin weave cotton or a plain weave cotton that is finished chemically to appear shiny. Percale : A smooth, finely combed woven sheeting with a minimum thread count of 180 threads per square inch. Sateen : A silky smooth fabric that has a lustrous sheen resembling satin. Swiss : It is a sheer, very fine cotton that can be plain or decorated with dots or other designs. Screen Printing : Printing formed by engraved rollers. Sham : A decorative covering for a pillow on a bed with a decorative flange. Silk : Continuous strands of filament fiber found in a cocoon. Seersucker : A lightweight cotton fabric with a woven crinkle achieved by altering tension in the warp yarns. Seersucker is synonymous with the classic summer suit. Table Skirt : Gathered, tailored, or pleated piece of fabric that reaches from the top of the box spring to the floor. Terry Cloth : A cotton fabric with moisture-absorbing loop pile covering the entire surface on one or both sides. Used for home fashions, as well as summer apparel. Twill : Identified by the diagonal lines on its face. It is an incredibly versatile fabric. Velour : A term applied to cut pile cloths in general. Velour is soft, luxurious and widely used. Velvet : A warp-pile fabric with short, densely woven cut pile, giving the fabric a soft, rich texture. Wool : Fibers that form the covering of a sheep. Whipcord is a strong fabric with a diagonal round cords that can also be produced in wool. Using a needle and thread. This is the most flexible of the lace-making arts. While some types can be made more quickly than the finest of bobbin laces, others are very time-consuming. Some purists regard needle lace as the height of lace-making. Know also that this type of lace is a rare find and can be rather expensive. The finest antique needle laces were produced from a very fine thread that is not manufactured today. 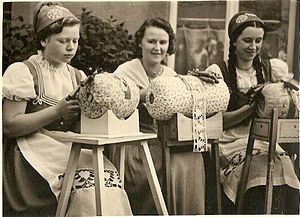 Cutwork, or whitework; lace constructed by removing threads from a woven background, and the remaining threads wrapped or filled with embroidery. You will also find cutwork in linen tablecloths, draperies, or other intricate linen uses. Bobbin Lace; as the name suggests, made with bobbins and a pillow. The bobbins, turned from wood, bone or plastic, hold threads which are woven together and held in place with pins stuck in the pattern on the pillow. The pillow contains straw, preferably oat straw or other materials such as sawdust, insulation Styrofoam or Ethafoam. Also known as Bone-lace. Chantilly lace is a type of bobbin lace. Do you hear a song coming on? Tape lace; makes the tape in the lace as it is worked, or uses a machine- or hand-made textile strip formed into a design, then joined and embellished with needle or bobbin lace. Used to finish off a sewing piece. Knitted lace; including Shetland lace, such as the “wedding ring shawl”, a lace shawl so fine that it can be pulled through a wedding ring. Guipure; The stitching area is stitched with embroidery threads that form a continuous motif. Afterwards, the stitching areas are removed and only the embroidery remains. The stitching ground is made of water-soluble or non heat-resistant material.